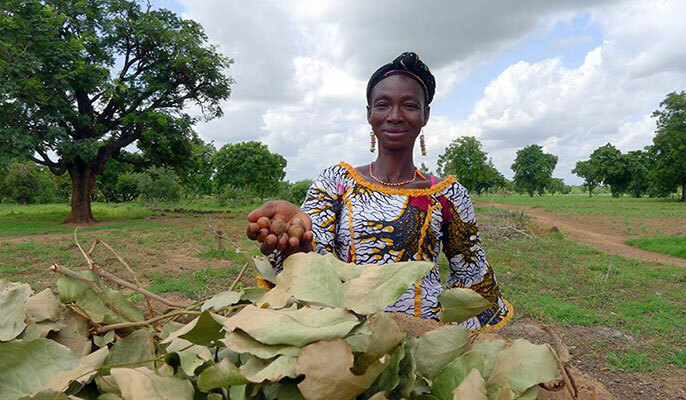 This Southern Burkina Faso farmer holds a handful of shea nuts, an orphan crop in Africa. When Amrita Hazra moved to the United States from India in 2005 to start graduate school, she noticed that grocery stores were packed with products based mostly on three grains: wheat, corn and rice. Amrita Hazra started the Millet Project at UC Berkeley. In 2011, she came to UC Berkeley as a postdoctoral researcher in plant and microbial biology and saw that despite the drought, California farms still grew those same grains: wheat, corn and even rice. Hazra remembered eating a wide variety of grains in her homeland, including many types of millets — gluten-free cereal grains that are drought-tolerant and highly nutritious. That gave her an idea. She started the Millet Project to introduce more people in the U.S. to the benefits of millet to help deal with drought and diversify the food supply locally and globally. From diversifying food to developing new varieties to adapting crops to a changing climate, the University of California and its Global Food Initiative are working to help improve food security this World Food Day. UC’s Division of Agriculture and Natural Resources alone has collaborators in more than 130 countries working to help solve agricultural problems. The push to end global hunger got a boost this summer when President Obama signed the Global Food Security Act, which builds on efforts such as the federal Feed the Future initiative. UC leads six Feed the Future Innovation Labs — five at UC Davis and one at UC Riverside. The labs work to develop climate-resilient crops such as chickpea, cowpea and millet, and also look to improve poultry, produce and increase food access. Abundant in protein and energy-rich oils, cowpeas — also known as black-eyed peas — are central to the diets of millions of people across Africa and Asia. But according to UC Riverside’s Timothy Close and Philip Roberts, the legume crop is performing at only 20 percent of its genetic potential. So they’ve set out to breed new cowpea varieties that have both higher yield and quality, along with disease resistance, pest resistance and drought tolerance. By applying cutting-edge plant breeding tools, UC Riverside is creating new varieties of cowpeas. To accomplish this, they’re using a genetic tool called DNA marker-assisted breeding — in essence, a process that uses genetic analysis to find and select for specific desired traits, vastly speeding up the traditional hybridization process. In its first four years, the UC Davis-led Feed the Future Horticulture Innovation Lab trained nearly 32,000 people in more than 30 countries, including more than 9,800 farmers who have improved their farming practices. Building on those successes, an international team led by UC Davis is working to connect 9,000 rural households in Guatemala with improved water management and climate-smart agriculture strategies to increase food security and reduce poverty. Called MásRiego (“more irrigation”), the Feed the Future project aims to increase farmers’ incomes and their use of climate-smart strategies, including drip irrigation, rainwater harvesting, reduced tillage, mulch use and diverse crop rotation. “We’re taking lessons learned from our previous research — in Guatemala, Honduras and Cambodia — and building a team to help more small-scale farmers apply our findings and successfully use these innovative practices,” said Beth Mitcham of UC Davis, who directs the Horticulture Innovation Lab. First prize in the UC World Food Day Video Challenge went to a team of UC Davis students working on innovative produce storage research. Students and recent graduates also are playing an important part in efforts to address food security on campus and globally. Several winners of the Global Food Initiative’s 30 Under 30 Awards are tackling hunger, such as UC Berkeley alum Komal Ahmad, a former Big Ideas @ Berkeley winner who founded Copia, a food recovery business that connects those with excess food to those in need of it. In UC’s systemwide World Food Day Video Challenge for students, first place went to a UC Davis team working to improve postharvest produce storage in developing countries, enhancing food safety and quality. In addition, UC is partnering with the U.S. Agency for International Development to expand the Research and Innovation Fellowship program, which addresses pressing agricultural development challenges around the globe. The program has grown to four UC campuses — Berkeley, Davis, Riverside and Santa Cruz — with the possibility of further expansion, co-sponsored by the UC Global Food Initiative. Pamela Ronald and husband Raoul Adamchak on the UC Davis certified organic farm. The banana is one of the world’s top 10 staple crops, but it could be wiped out in just five to 10 years by fast-advancing fungal diseases. UC Davis researchers have discovered how three other fungal diseases have evolved into a lethal threat to the world’s bananas. The discovery better equips researchers to develop hardier, disease-resistant banana plants and more effective disease-prevention treatments. Roughly 1 in 9 people on Earth do not have enough food to eat. And climate change is only making it harder for farmers to meet the global demand for food. To this end, the new Center for Research On Plant Transporters at UC San Diego, funded by a $6 million grant from the National Science Foundation, aims to help develop the molecular tools necessary to grow the hardier crop varieties that farmers need now and will increasingly need in coming years — corn, wheat and rice that are more tolerant to heat, drought, salinity and other adverse conditions. UC Berkeley’s Peggy Lemaux, a member of the Millet Project team, leads a $12.3 million project funded by the U.S. Department of Energy to examine the role of epigenetics — the study of how heredity affects gene expression — in allowing plants to survive in drought conditions. UC Berkeley researchers will partner with scientists at UC ANR, the Energy Department’s Joint Genome Institute and that agency’s Pacific Northwest National Laboratory on the five-year project. Researchers will dissect mechanisms by which sorghum, a close relative of corn, is able to survive water deprivation. Meanwhile, the African Orphan Crops Consortium, run by UC Davis, Mars Inc., and other global partners, is working to sequence, assemble and annotate the genomes of 101 African crop species to improve the nutrition of the African farm families who depend on them for sustenance. At the consortium’s Plant Breeding Academy, Africa’s top breeders learn how to incorporate genomic information, statistics and the latest breeding strategies into their programs. Daniel Adewale, plant breeder with the Ondo State University of Science and Technology in Nigeria, is using the skills he learned in the 2014 academy to improve the African yam bean, increasing its essential amino acid content and reducing its cooking time. “By helping breeders improve these forgotten crops, I believe the African Orphan Crops Consortium will cure malnutrition in Africa,” Adewale said. Aquaculture may provide vital avenues for sustainable food in the future, according to UC Santa Barbara's Steve Gaines. The answers to the global food crisis may also come from the sea. If projections hold, the global demand for animal protein will double over the next four decades, rising along with pressure to find ecologically sustainable food production practices. Could farmed fish save the day? Just maybe, says UC Santa Barbara’s Steve Gaines. “There are some really bad ways to do aquaculture, but if you look at best practices, they are dramatically better than any production on land,” Gaines said. The Millet Project is transforming expectations of what nutritious food looks and tastes like. The Millet Project, which began by collaborating with farmers to conduct small-scale millet cultivation in different locations in Northern California, is going global. Hazra is now an assistant professor at the Indian Institute of Science Education and Research in her hometown of Pune, where she finds a renewed need to promote millet as rice and wheat are overtaking India’s urban grocery stores. Hazra plans to start a millet patch on campus. She also is collaborating with educators to add farming to the curriculum of schools in Mumbai and with a brewer in Pune who wishes to use millet to brew beer. “By being involved with the project, I wish to continue growing with it, and along with our team, bring food security and food and agricultural diversity to people around the world,” Hazra said.